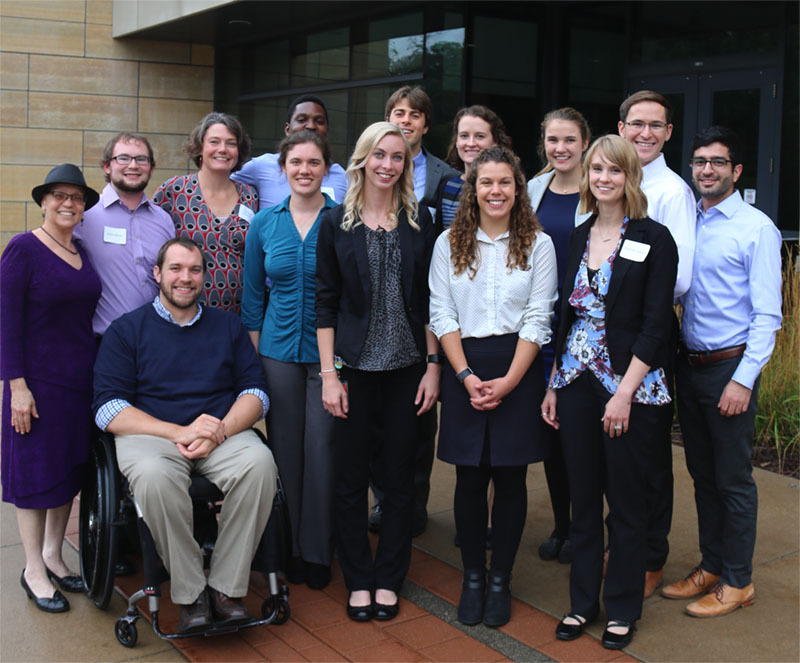 A joint team of students from the University of Iowa and Iowa State University were chosen as winners of the 2017 One Health Day Student Events Competition for their efforts to organize the second annual Iowa One Health Conference. The award, presented by the One Health Commission, was established to encourage students (secondary, undergraduate, graduate, and professional) to set up One Health events that facilitate student delegates working together from different academic disciplines and backgrounds. The Iowa One Health Conference was hosted at the University of Iowa College of Public Health in October 2017. It was convened to illustrate the collaborative effort of the many health and social science fields that work to improve the health of humans, animals, and the environment. Neil Vezeau, conference co-chair, veterinary medicine student at Iowa State University College of Veterinary Medicine. Jake Swanson, conference co-chair, completed his undergraduate degree at Iowa State University College of Agriculture and Life Sciences and master’s degree in public health from Emory University. He currently works at the Iowa Department of Agriculture and Land Stewardship. Morgan Bobb, lecture session coordinator, MD student in the University of Iowa Carver College of Medicine / PhD student in epidemiology at the University of Iowa College of Public Health. Lauran Chambers, poster contest coordinator, a senior at Iowa State University and the chairperson of the 2018 Iowa One Health Conference. Amanda Janson, director of conference assessment, MPH student in epidemiology at the University of Iowa College of Public Health. Eric Kontowicz, onsite conference coordinator, PhD student in epidemiology at the University of Iowa College of Public Health. Kurayi Mahachi, conference webmaster, MPH student in epidemiology at the University of Iowa College of Public Health. Ethan Wilson, keynote speaker logistics, MS student in epidemiology at the University of Iowa College of Public Health. Faculty advisors for the Iowa team were Dr. Claire B. Andreasen, professor and director of One Health in the Iowa State University College of Veterinary Medicine, and Dr. Christine Petersen, associate professor of epidemiology at the University of Iowa College of Public Health. In addition, the One Health Student Innovation Club at Makerere University in Kampala, Uganda, also received a One Health Day Student Event award for their efforts to organize a rabies vaccination and awareness campaign in Uganda. Both teams were awarded a $2,000 prize. More information about One Health Day is available online at www.onehealthday.org.